Nice. I have one to compliment my longer Schofield. It seems to balance in the hand better than the bigger Schofield. Schofields are great guns. I have found that they are great for educating non-SASS shooters who are familiar with more modern pistols. The way the guns are lined up with lower bore axis/cylinders makes for more of a recoil push directly back towards the shooter, very much like a semi auto pistol. There's less rotation in the grip when compared to Vaqs or SAAs. All Schofields are undisputed champions of the loading/unloading table. Pard's, Years ago I had one of the Taurus Thunderbolts. It was a fun gun but alas it was sold. Now I'm kinda looking again at them. Taurus doesn't sell them but Uberti is making a version. How does the Uberti one shoot? Is it easier to load/unload? Any one run one? Good points/bad points? HPA = Hearing Protection Act. A continuously proposed piece of legislation to get silencers/supressors removed from the NFA. Basically, silencers would be available for purchase without all the federal taxes. Our current congress will NOT take this up so it's deader in the water than the Lusitania. As you state, there's a pile of post 1899 calibers that are allowed. Others include 357 Magnum, 44 Special, 44 Magnum, 32 H&R Mag, and the latest bee's knees 45 Cowboy Special. If a revolver is of an older design but chambered in a modern cartridge and can meet all other requirements (power factor). This smaller pistol in 380 may be the ideal pistol for shooters of smaller stature/youth. If Nagant revolvers in 380 are legal I don't see why this pistol wouldn't be. If it meets the power factor should be gtg. I'd like to see one of these. Tried to send you a message on the 1875 but don't know if it went through. Write if you can. If you want a good smooth trigger pull do NOT get a Sharps like I own. The Sharps Cavalry Carbine has a heavy 20+ lb trigger pull! I've been told the originals were like that as well...no need for a hair trigger when you're trying to shoot from horseback. Yes and no...they're selling "old west" stuff. Not every shooter associates CAS with "old west". 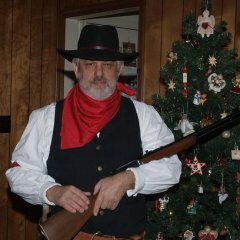 There's a large group of the shooting populace that will associate any lever gun (like grandpa's 30-30) with the old west. Old west gets hits...saying CAS will get people confused. Saying SASS will get them sued. Now it's SAMs and IADSs. Flak also was called Archie or Ack Ack. The term Archie is from WWI. Thanks GW, Brazos, and Yusta...you're good pards.